Joel Chandler Harris was an American journalist born in Eatonton, Georgia, best known for his collection of Uncle Remus stories: Uncle Remus: His Songs and His Sayings; The Folk-Lore of the Old Plantation (1880), Nights with Uncle Remus (1881 & 1882), Uncle Remus and His Friends (1892), and Uncle Remus and the Little Boy (1905). FCIT. "Joel Chandler Harris author page." Lit2Go ETC. Web. 24 April 2019. <https://etc.usf.edu/lit2go/authors/131/joel-chandler-harris/>. 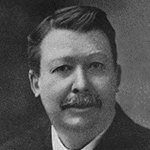 FCIT, "Joel Chandler Harris author page." Accessed April 24, 2019. https://etc.usf.edu/lit2go/authors/131/joel-chandler-harris/.